This is a favorite of my wife's family. Constructed from a six foot 12 inch board. 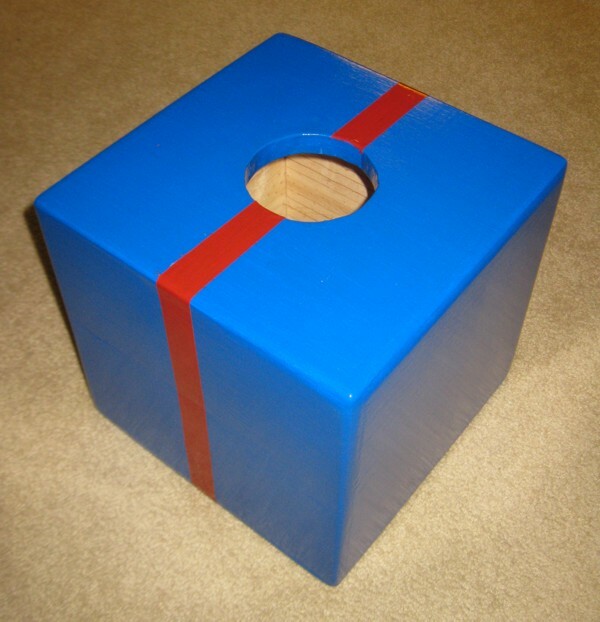 Prime, then paint in blue with a 1 inch red stripe. 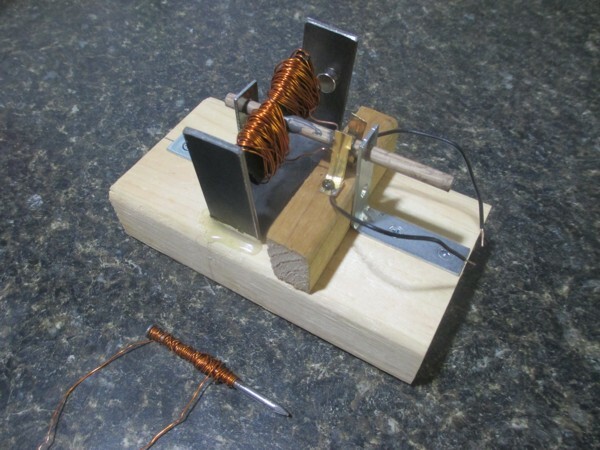 One of the project options for the Boy Scout Electricity Merit Badge is to build a simple motor. Unfortunately, the example motor in the merit badge pamphlet is of extremely poor design -- I have no idea how anyone could get it to work. Instead I have scouts build the motor below. It takes a scout about 2 hours to complete and should be done in at least two sessions because it requires the epoxy to set for attaching the commutator and rotor iron to the shaft. Being retired military, brass parts of old military ribbons are used for the brushes. I cut, grind, and drill the armature steel and the field bracket ahead of time since the tools to do so aren't available where the Scouts construct the motor. The motor pictured below was constructed by a Boy Scout in February 2014. A well aligned and constructed motor will run off of a 6 volt lantern battery. The motor will run better with a higher voltage. I typically use one of my American Flyer train transformers and a 10 amp rectifier (way overkill) to power the motors. Every scout that has constructed one of these motors has been successful in getting it to run. Over a dozen of these motors have been built. For a home-made DC motor, the hardest thing to get right is the commutator. Much frustration will be experienced in trying to get a home-made motor to run if a poorly deigned commutator is used. The commutator used in this design is very robust and as a result most motors will run the very first time if the brushes are making good contact with the commutator.